Noel Blakeman is a contemporary sculptor who produces stunning one-off pieces of art for both private and commercial clients. The studio is run by husband and wife team Noel and Rachel Blakeman. 15 years ago, whilst on a business trip to New York, Noel decided he wanted to give up his city job to ‘make things out of metal’. Having traded in his brogues for steel toe-capped boots, he went back to college to study the art of blacksmithing, before setting up his own studio in Northamptonshire, England, which has been producing unique pieces of art for clients around the world ever since. 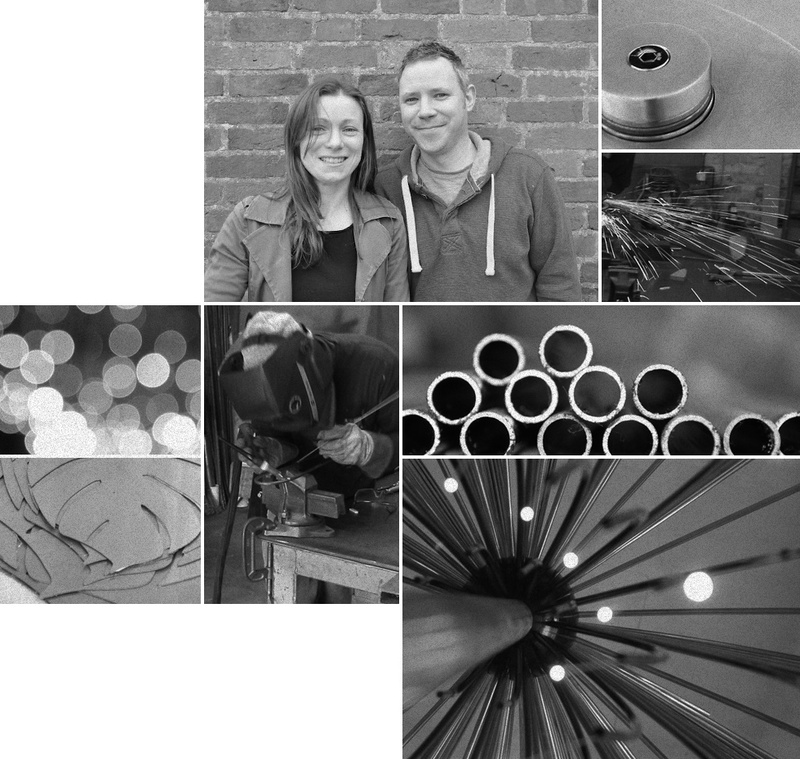 Noel has a passion for designing and making contemporary functional sculptures using metal as the main medium. He has a love of nature and is inspired by the complicated mathematical formulae that are often present in the natural world. Throughout the majority of nature and especially in seed heads you find examples of the Fibonacci series and Phi (the Golden Ratio). Noel uses a combination of both of these mathematical theories in every piece that he makes. This process allows him to fuse maths with art, both of which are close to his heart. Rachel joined the business to oversee the development of Noel’s work in participatory arts in the public realm, in particular to inspire and intrigue young people who may not have had much exposure to the arts. Every Noel Blakeman piece is handcrafted and custom made according to client’s preferences. Each piece can vary in size, material, colour and style depending on budget, taste or the environment for which it is intended. Once commissioned, Noel will work closely with his client to keep them informed of the progress in designing and crafting the piece. If you wish to commission a unique piece of art for your home or garden, please email or call us to begin the process. We are passionate about working with local communities and therefore this area of our work has been a very exciting development to the business. We consider it a real privilege to work with communities and provide chances to inspire people to take an active interest in their surrounding environment by significantly enriching the experience of a common place. On another level this can provide inspiration to individuals to consider their own potential to pursue a career in the arts. Over the last two years we have been involved in a broad range of school art projects. This has included working with all 3 Key Stages, Special Needs and Looked After Children. We have developed exciting and interactive sessions which use visual art as a vehicle to hone other skills such as; confidence building, self belief, team working, presentation skills, improved literacy and numeracy skills plus other areas of the National Curriculum. Rachel is a trained arts Award Adviser and can support individuals to achieve a Bronze or Silver level Arts Award.